Distributor: Currently licensed by Bandai Visual, available streaming on Tubitv.com. Notes: Based off a popular series of RPG dating-sim games from Koei. To date there are four Harutoki games, each taking place with different reincarnations of the Hachiyou (though played by the same seiyuu). There is also a Harutoki manga running at present, reaching at least 8 tankobon now. There were also two OVA series released, the first based on the first game, the second based on the second game. There are countless Harutoki drama and vocal CDs (I stopped counting at 25...) as well as numerous concerts and live seiyuu events revolving around Harutoki. Motomiya Akane is your average high school student, best friends with anti-social and fiery Morimura Tenma and her lower-classman, the childish, dependent Nagareyama Shinmon. They are walking to school together one day when Akane hears an eerie voice in the wind, beckoning her to come ... without warning, Akane and her classmates are transported into a far away time ... right in the center of Heian-era (?) Japan! Akane is deemed the Ryuujin no Miko, vessel of mysterious and miraculous powers. Together with eight skilled (and beautiful) warriors from around Kyou (the capital), they must save the land from the Oni clan. Akane's powers are led to believe that she could save the world ... or if swayed to the wrong side, could destroy it. The leader of the Oni clan is doing everything in his power to persuade her to join his side, and somehow Akane finds herself strangely drawn to him. Meanwhile, the Hachiyou are trying to protect her from the Oni clan, and even herself. Will they succeed and save Kyou from imminent destruction in the hands of Akram and the Oni clan? Mmmn, where have I seen this anime before? I started watching this series, not expecting too much since it was, after all, based off of a video game. And what anime based off video games ever turn out to be any good, I ask? I must admit, the animation for this series is nothing short of stunning, and actually quite shounen-style for its shoujo demographic. The colors are bright and saturated instead of pale and pastel, and sharp angles instead of the rounded, soft curves of most shoujo anime. Many people will find themselves comparing this series to Fushigi Yuugi, and rightfully so. They are, essentially, the same genre, aren't they? Girl student gets zapped into a magical ancient world (Japan in this case, instead of China or Gaia) only to be begged to save the world using magic powers that have yet to be awaked in her. Of course, she agrees, completely ignorant to the whole story, but she's cute! Who cares if she's clueless? After all, it is always the clueless, pointless, helpless, [insert adjective here]-less girl that every single one of her guardians just falls haplessly in love with, to the point where none of the guys can get along with each other because they are fighting over who gets to protect the girl. Some people like this series better than Fushigi Yuugi. 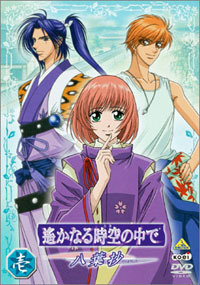 Admittedly, the animation is light-years better than the Fushigi Yuugi series. The character designs are also far more exciting. However, these are all shallow reasons to prefer a series, if you ask me. The only thing more shallow than that are the actual characters in HaruToki. Instead of investing in having guardians with depth (which might make up for the flatter-than-a-two-week-old-liter-of-Pepsi heroine), they paid more attention to their hairstyles than their actual characterization. On an additional note, HaruToki is one of those animes that showcases some of the best male talent that the seiyuu community has to offer. It is a pity this series couldn't do more to stretch their abilities. Of course, I am only halfway through the series. They just finished introducing Eisen, the final Hachiyou into the mix at episode 11. But Harutoki is only 24 episodes. Fushigi Yuugi was 52 and then some. The characters in this series are too macho and mysterious, without any flaws. Additionally, the comedy relief in this series is severely lacking, and the attempt with the tiny demon Tengu is not only annoying, but extremely un-funny. It is obvious that he was included as obligatory comedy relief for any kiddos watching. HaruToki is essentially the female equivalent of a boy's harem anime. I have heard the manga/video game/etc. is much better, and that this is a severe improvement from the OVA series that preceded it. I am just calling it as I see it. This is mindless fluff, which suffers from stale characterization and lack of originality--to the point where even a few cliches wouldn't hurt. Recommended Audience: Best for hormonal teenage girls who like thinking about lewd things such as OMGYAOISLASHHOTSTEAMYMANSEX and other things. It is very easy to ignore the heroine and indulge in those sorts of fantasies with this series, even easier than with Gundam Wing or Fushigi Yuugi.